A fast, reliable and right first time sample provided. Colour matching as a first step is as simple as providing us with either a sample, (granules, moulded part, film etc), or else a RAL/Pantone colour reference. 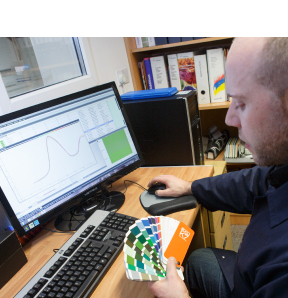 DeltaQ specialise in colour and property additives and because of this, we are able to spend time developing new masterbatch products to meet specific requirements. Our service is a total package including technical advice, colour matching, manufacture and supply. We also offer Kanban and other managed stock and supply chain management options which are available on request. For engineering plastics, please visit QPol. © 2019 DeltaQ Ireland. All Rights Reserved.